Second issue of Gendered Voices magazine: “Beyond the Binary”. 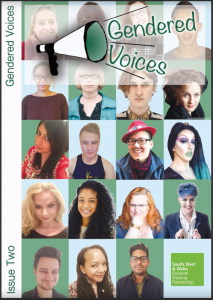 I am delighted to announce the recent publication of the second issue of Gendered Voices magazine: “Beyond the Binary”. The magazine is published by the Gender and Sexuality Research Cluster of the AHRC SWWDTP and features work by postgraduate students, academics, and a guest article from the charity sector. This interdisciplinary magazine celebrates diversity and intersectionality. It includes topics such as drag culture, non-binary identity, transgender experience, lgbtq issues, gender fluidity in 19th century France, The Inca Empire, pirates, and much more! Thank you to all the Reading PhD students who contributed articles and photos to the magazine. 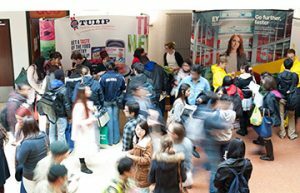 The issue certainly demonstrates the richness of postgraduate research in the UK. 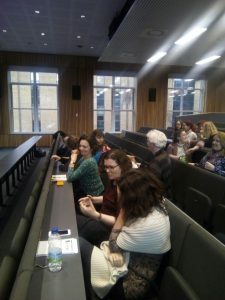 As we received such a high level of interest from our fellow postgraduate students, we will certainly be publishing a third issue in the future. Watch this space! The magazine is intended for an audience both within and outside academia, so do please share this magazine with your peers and friends. We hope you enjoy reading it as much as we enjoyed putting it together. Hello, my name is Ashleigh Embling and I’m a final year French and International Relations Student. 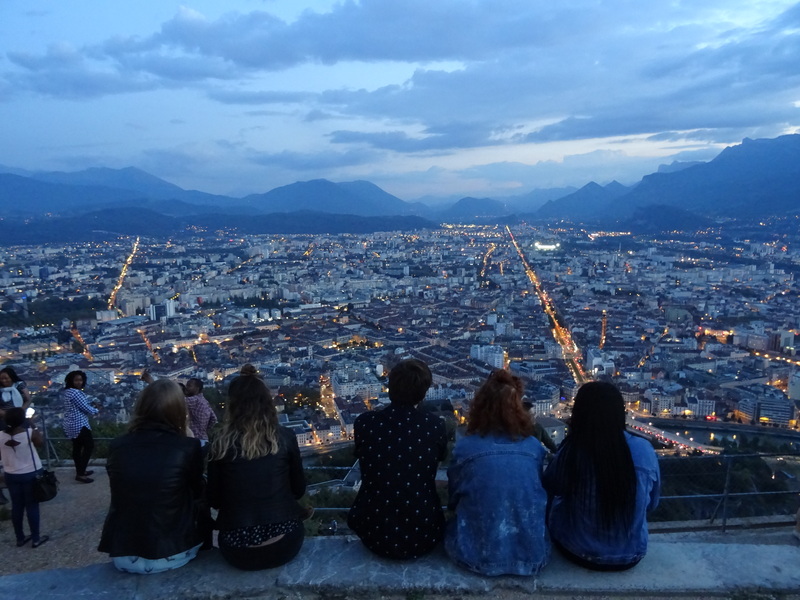 I spent my year abroad studying at Sciences Po Lyon, in Lyon. Studying at a Grande Ecole was a challenging experience, but incredibly rewarding and enjoyable. I chose to study because although the aim of the year abroad is to focus on our language development, I really wanted to keep up the International Relations side of my degree and Sciences Po provided the perfect place to do this, whilst also massively improving my language skills because of the lectures being in French. Studying also provided an environment where it was easy to meet other people doing Erasmus placements, so I had a group of Erasmus friends and our common language was French which really helped improve my level of fluency. Lyon was unlike anywhere I’ve lived before, it’s the third largest city in France and shows this in its vibrant culture and welcoming atmosphere. Lyon has 9 arrondissements, each with its own personality. My preferred areas are Vieux Lyon which is the historic quarter; home to old churches, a basilica and traditional French streets housing many small ateliers, and Croix-Rousse which is quite a young area with stunning views of the city. During my year abroad, I travelled to many places including Marseille, Siena, Paris and Madrid. 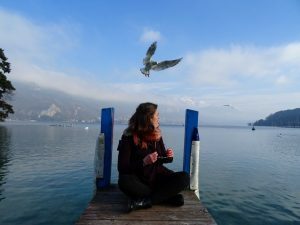 The photo that won second place was taken on one of my trips to Lake Annecy, in a town called Annecy on the Swiss-French border about an hour’s bus trip from Lyon. Being able to travel to so many places was definitely a highlight of my year abroad, and I’m glad I took so many photos like this one to be able to remember each trip! Venetian Dreams: Merging Languages and Art by Venetia Baker (French and Italian alumna). 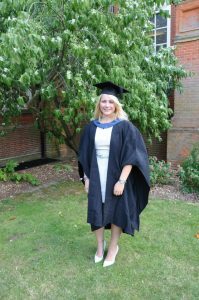 When I graduated from the University of Reading in 2012, I wasn’t sure where I wanted my degree in French and Italian to take me. I was passionate about languages, and my confidence in both languages was at its highest. I knew I wanted to use them in whatever career I would enter into. It was the desire to use my languages that spurred me on to accept a place on a Master’s degree in Technical and Specialised Translation at the University of Westminster. After graduating from my MA, I gained my first full-time job in a large translation company, TransPerfect, based in London. From here, I built on my knowledge of the translation industry and after one year I gained the confidence to go freelance, setting up my own translation business. I loved being in charge of my workload and building up a steady network of clients, both privately and through agencies. After two years of working from home as a translator, however, one of my other passions was niggling at me, and I realised that there was perhaps another career route for me where I could combine my love of languages with my passion for the arts. I had studied a few history of art modules during my time at Reading and during my year abroad in Padua, and in particular I had enjoyed learning about the art of the Italian Renaissance. I wanted to build on this knowledge and learn more about the field of art curation in a contemporary setting. What better way to do this than by enrolling on a course in Curatorial Practice and Contemporary Art in the Italian heart of contemporary art: Venice. 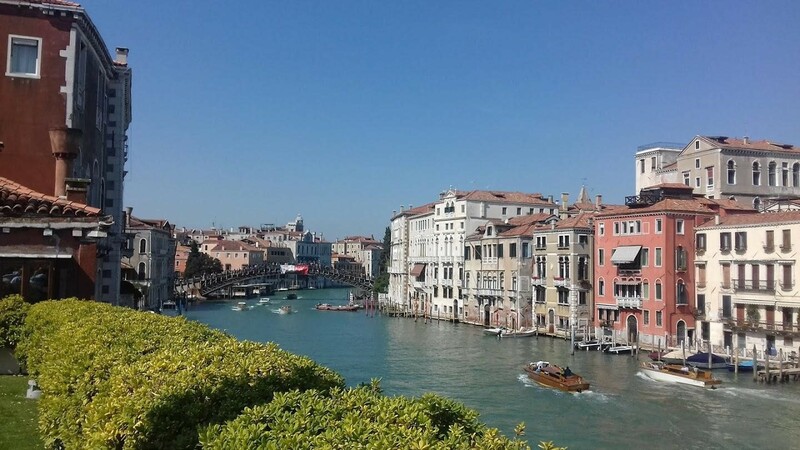 I hadn’t realised what I had let myself in for when I landed in Venice last October and made my way to my rented apartment, just outside of Venice in a town called Malcontenta. I was hopeful that the name of the town wasn’t an omen of how the year to come would pan out! 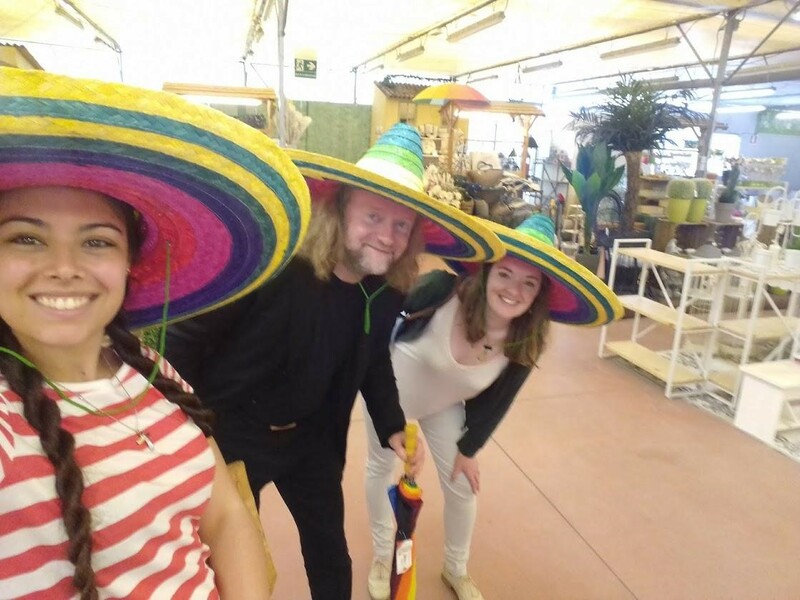 Taught completely in Italian, in a class of 20 Italian students, I was truly immersed from the word go, and was suddenly grateful for all the intensive language skills classes Enza had put us through in fourth year! I particularly loved the location of my school in Campo Santo Stefano, near to the Accademia bridge. I would take my morning “caffè ginseng” in the campo before attending lectures on curatorial practice, art project management, fundraising, graphic design, press relations and conservation in the crumbling Conservatorio di musica Benedetto Marcello. The course worked towards the creation and realisation of an art exhibition, which we designed and managed as a group. The best part of this process for me was working with internationally renowned contemporary artists, getting to discuss with them their artworks, and helping them throughout the exhibition process, from choosing the artworks to their arrival in Venice and installation. It was an exhausting but incredible experience, and to top it off we got to attend the openings of several exhibitions as part of the Venice International Art Biennale, meeting artists and networking. During my time in Venice, I also managed to fit in a one-month internship at the amazing Peggy Guggenheim Collection. I loved being surrounded by the incredible artworks in the collection, from Picasso’s, Dali’s, Matisse’s, Miro’s, Giacometti’s and Brancusi’s, to Pollock’s, Still’s, Bacon’s, Warhol’s and Fontana’s. 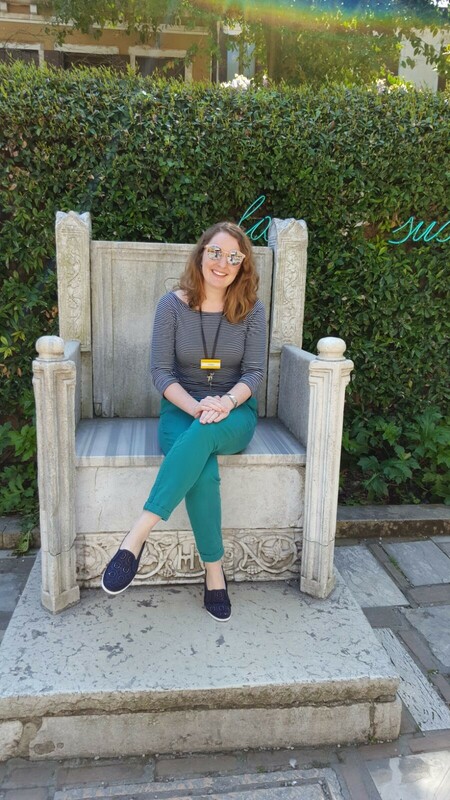 The art collection of the PGC is out of this world, and I absolutely loved guarding the galleries, selling tickets and preparing talks for the public on the life of Peggy Guggenheim. My favourite part however was putting the artworks to bed every evening, by placing their “pyjamas” over them and being the last ones left in the museum after the crowds had left. What a dream! This experience also enabled me to learn more about the running of a small art museum, and a particular highlight for me was having a private guided tour of the collection by the Director, Dr Philip Rylands. Having returned to the UK in May, I am now working at Royal Museums Greenwich as a Bookings and Customer Service Coordinator, having started in the museum as a Visitor Assistant. I love my job and couldn’t ask for a better place to have my office – a Unesco World Heritage site surrounded by wonderful artworks and historical artefacts. 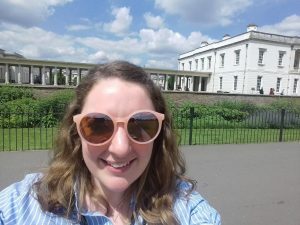 My team are from all over the world, and I use my languages on a daily basis both with my colleagues and our visitors, and I’m hoping to develop within the museum, and perhaps one day move into the curatorial department, if the opportunity arises. Amongst all the craziness of my time in Venice, I also got engaged there at the start of my course. 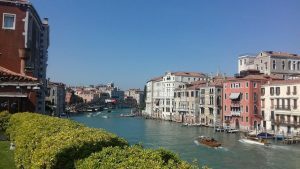 A perfect place to be proposed to, being the lady of Venice! My fiance, a fellow Reading Modern Languages graduate, and I are now busy planning our wedding and looking forward to building our future together. Hello, my name is Michael O’Hagan and I spent my year abroad in Paris for a 10-month internship, working as a purchaser/product manager. 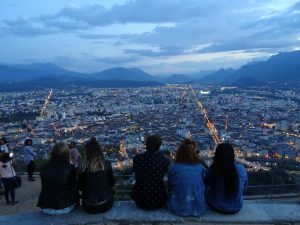 Obviously completing an internship abroad is a bit more fast-paced than studying abroad, but it was just so worth it. Well, what can I say about Paris? It’s an incredible city. I didn’t actually live in the centre of Paris (to save money), but in a very small town about an hour’s commute south of the ‘périphérique’ (ringroad) which encircles central Paris. Although the commute was long, it was really nice to be out in the quieter countryside with fields and a forest, but still close enough to the centre of the capital. To give you a bit more of an insight into my internship, I worked for a company which buys and sells new and used cars in France. I was a purchaser of new cars, so I was contacting suppliers all over Europe to buy cars from them and import them to France. The first few weeks completely flew by as I tried to take in all the French I could, and learn the principle tasks of my internship. Once I settled in, I was quickly given a lot of responsibilities, which was awesome, seeing as some French internships offer interns seriously limited responsibility. As I speak Czech too, I was able to travel to the Czech Republic in December for 4 days with my manager, to meet new suppliers who I had made first contact with over the phone. This was the toughest but also the most rewarding experience of my whole life. I could go on forever about my internship, but I should instead say to all future languages students looking to potentially do an internship instead of studying abroad, to not hesitate even for a second to search and apply for internships. It will change your life, and give you some serious experience to help you stand out from other candidates in applications for jobs after university. 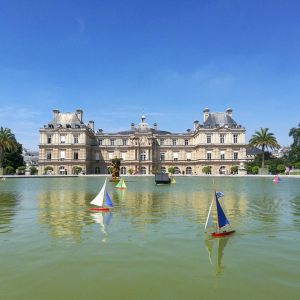 The photo I took is of the Jardin du Luxembourg in Paris, in summer time after my placement had finished. It was easily 30-35 degrees at the time! Not bad for Paris, I know. The photo shows that although Paris can be a really loud, bustling, and busy city, there are so many chilled and relaxing parks you can go to and take some time out. As a parent it is difficult to support a child through university as there is little contact with the university and the student is away from home. I was also very aware that in supporting James from afar, it was important that he learned the skills and techniques he needed to get him through difficult times. Whilst this was a challenge in years 1 and 2 it became more difficult in his year away. All students find coping away from home challenging and James was not unusual in feeling lonely and homesick. In his first week away in France I know he contacted you (as indeed I did as I was concerned about how low he was feeling). The university was quick to respond in making contact with James and giving him the advice he needed. I know that in both France and Italy James was helped by lecturers and staff in Reading. Without this support I think he may have questioned if the trip abroad was a worthwhile and manageable event for him. In fact, the support James received was key in making the year abroad the success it turned out to be. In France, he made many friends and had a thriving social life. I went out to see him with his brother and sister in October 2015 and was so impressed with the quantity of local knowledge he had accumulated. He guided us around Poitiers, showing us many lovely churches and courtyards and was clearly happy and relaxed. 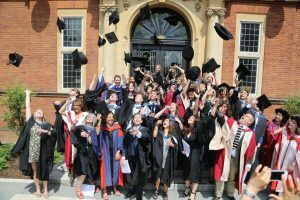 On graduation day, the department’s lecturers remarked that James returned back to Reading for his fourth year with a very different attitude and approach towards his studies. He had matured in his time away and dealt with many issues that were making him unhappy. He felt more confident in his ability to deal with the challenges life presents us with. He worked hard at his studies and secured the 2.1 degree he wanted to get. He got involved with extra curricular events such as the radio show and the video promoting foreign languages. He was much more positive and wanted to do well. To the department I would like to say: never forget or underestimate the profound positive impact you and your colleagues have on the young people who are so lucky to have you. Imparting knowledge, preparing and delivering lectures is such a big part of what you all do but it is very clear to me that you provide so much more to your students. You reassure, listen and support. Alongside that pastoral care, you set high academic standards, which ensure students, reach their potential. I have no doubt whatsoever that your care and your professional skills were key to James’s success. Thursday April 6, 2017 marked the official launch of the Christopher G. Wagstaff Italian Film Collection at the University of Notre Dame. Wagstaff, who retired from the University of Reading in 2015 after four decades as a teacher and scholar of Italian, delivered a short talk at the event, which recognised his distinguished career as well as the generous donation of his personal film archive to Notre Dame. 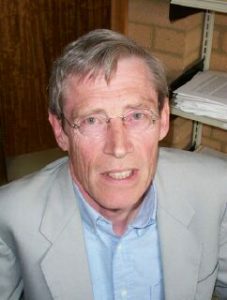 As Wagstaff’s former colleague Professor Zygmunt G. Baranski has said, in his long career at the University of Reading Chris “worked tirelessly and, at times, eccentrically, to develop new undergraduate and graduate courses, to build a major film library, to establish national and international contacts and networks, to enlighten and encourage students, and, most importantly, to demand the highest standards of scholarly seriousness from himself and his students.” With that in mind, we want to take this opportunity to recognise Chris’s contribution to the University of Reading and to the wider Italian and Film-Studies communities. 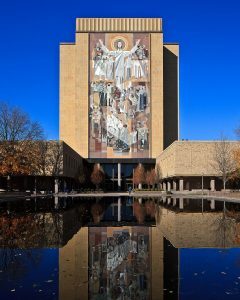 We asked Tracy Bergstrom, Curator of Italian Imprints and Co-Director of Digital Library Initiatives and Scholarship at the University of Notre Dame, to tell us about the archive. She explained that the Christopher G. Wagstaff Film Collection is built around roughly 2,000 Italian films and television programs donated from Wagstaff’s personal collection. These films are currently being catalogued and made available through the Hesburgh Libraries, as well as digitised for preservation purposes. Both digital and commercial copies are supplemented by the University of Notre Dame’s large print collection, housed in the Hesburgh Library, which explores the history, culture, and aesthetics of Italian media. Brendan Hennessey, Assistant Professor of Italian at the University of Binghamton and the archive’s first curator, further expanded on the significance of the archive. “The Christopher G. Wagstaff Film Collection aims to become a centre for the study of Italian film and television that will be open to scholars and students, a North American cineteca at Notre Dame, the first of its kind, capable of supporting extant research while promoting future projects in Italian screen studies. The mission of the Wagstaff Collection is not to preserve individual films, but to permit the study of a corpus of cinematic works facilitated by their digitisation. It will nurture research, screenings, curated film series, and scholarly events. In so doing it perpetuates Christopher Wagstaff’s original vision to expand our understanding of Italian cinema through the study of all types of Italian media production. 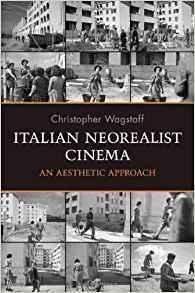 Over the course of his prolific career as both teacher and scholar in Italian studies at the University of Reading, Christopher Wagstaff’s role as amateur archivist reinforced his position as one of Italian cinema’s most respected interpreters. We at Reading are proud of the work that Chris has done and want to congratulate him on the launch of the Christopher G. Wagstaff Italian Film Collection at the University of Notre Dame. Well done Chris! 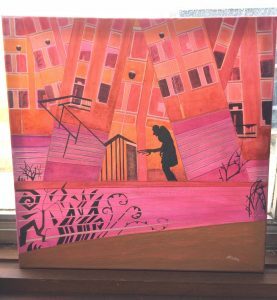 Staff in Italian and German studies were overwhelmed when Alicja Kobylecka, a BA German and Italian graduate, brought in a gift: three of her paintings based on films she studied with us. Two of the paintings depict films from the German final year module Cinema of the Weimar Republic. A third depicts a film from the second year module on Italian cinema. 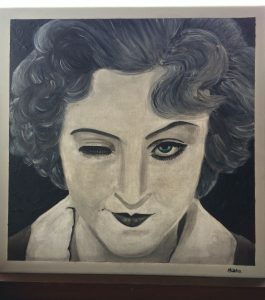 The winking robot Maria from Fritz Lang’s Metropolis (1927) is dedicated to the German staff; a second painting showing “German Expressionism entering HumSS Building” is based on F.W. Murnau’s Nosferatu (1922) and is a thank you to the Senior Tutor of DMLES, Dr Wölfel. The third painting depicts Gelsomina from Federico Fellini’s La strada (1954) and is dedicated to all of the Italian staff. Understanding the enigmatic world of a new culture through learning language in a social context is a fascinating but also quite challenging process. It definitely changed my perception of the world forever. Additionally, after being introduced by my lecturers to Italian Neorealism and German Expressionism, I was lucky enough to find an inspiration for my artworks. What a bonus! Therefore, to all the lovely people from the German and Italian sections I would like to say a big thank you for sharing your knowledge with me and for the amazing support all the way! The paintings will remain displayed in the Edith Morley building. There is nothing more rewarding for us then getting something so exceptionally creative back. We know that we are only as inspiring and productive as our students are. Thank you, Alicja! 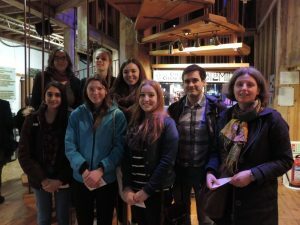 On Thursday, 16th March 2017, our first and second year German Studies students went to see FAUST X2 at the Watermill Theatre in Newbury. The play provided an interesting mix of Goethe’s and Marlowe’s versions of the tragedy of Dr Faust, whose unsettling story has fascinated and shocked readers and theatre enthusiasts throughout the centuries. Heinrich Faust, a genius and scholar, is driven by never-ending need to stimulate the senses and experience the unknown. Consequently, he becomes a very powerful wizard and is able to summon spirits and demons who obey him and fulfill his dreams. Eventually, he summons the strongest of all, Mephisto. Mephisto – the devil himself – is willing to form a pact with the greedy scholar but not without a prize. If Mephisto wins the love of Gretchen – the most innocent and beautiful women who ever treaded the earth, he will receive Faust’s soul in exchange. Faust willingly agrees and so the tragedy begins. when the story was written. He is supported by Jacques Miche as a cunning Mephisto who allows Faust to use his body as an alter ego, and Daisy Fairclough who convincingly plays the innocent maid Gretchen that suffers a lethal fall from grace by falling for Faust’s desires. Intriguing music and sound effects added to a very exciting theatre experience for students and staff alike. Overall, it was a very successful and fascinating evening. Ze Germans and ze British: Just good Frenemies? A lot of people know about the German connections of the British Royal Family during the 18th and 19th centuries. But did you know that what was to become British Gas was founded by two German chemists in the 19th century? That Germans were the largest group of foreigners in Britain in the 19th century? That German academics are the largest group of foreign nationals working at British Universities (including at Reading University)? That the Germans are obsessed with a British comedy sketch, Dinner for One, which is shown, and has been shown for decades by every German TV station throughout the day each year on New Years Eve for decades? That two Germans invented the Doc Martens’ air cushioned sole? A pop-up travelling exhibition, provided by the UK-based Migration Museum Project, explores such relations between Britain and Germany. It is currently on show at the University of Reading and will remain here until 24 March. It can be visited anytime between 9am and 5pm on weekdays in the Humanities and Social Sciences Building on Whiteknights Campus, room 274A. More directions and a couple of weekend dates for external visitors can be found at the bottom of this post. The exhibition consists of a small number of panels that explore different groups of German migrants to the UK, from the Royal family to the poor and the refugees during the Second World War. It also explores different economic as well as cultural connections between the UK and Germany from Early Modern Period onwards. There is also a panel about stereotypes and sport – yes, football gets a mention, too; but did you know that a German doctor working in London inspired the Paralympics? Each panel provides specific examples as well as a short text about the historical background. Showing this exhibition is timely – with a view on a pending Brexit – and equally interesting from a German as well as from a British perspective, as it describes a part of British migration history and illustrates how (groups of) migrants contribute to the country that they make their new home, and partly also the difficulties that they may face. A little programme of events around the exhibition also attracted visitors, such as a panel discussion about “The Brelephant in the Room: Living in post-referendum UK as an EU citizen”. Two more events are coming up: A guest lecture by Dr Stefan Manz about “German Immigrants and the First World War. 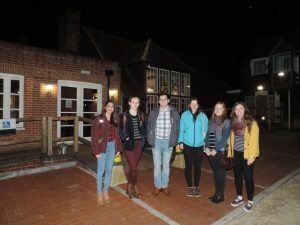 A Centenary Perspective” on Wednesday, 1 March, 4-6pm and a presentation by Final Year German Studies students who interviewed German academics working at the University of Reading on Wednesday 15 March, 4-5:30pm (meet in HumSS 274A for both). 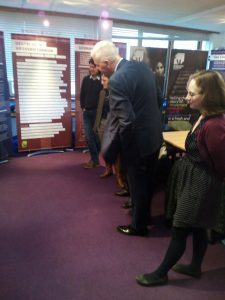 The exhibition and events are supported by the Vice-Chancellor’s Endowment Funds for academic events, the School of Literature and Languages and the Heritage and Creativity Institute. The Humanities and Social Sciences Building (HumSS) is located on Whiteknights Campus, building number 1 on the map: Room 274A is on the second floor. The exhibition is also open to visit on the following two Saturdays: 4 and 18 March, between 8am-12pm and 2-4pm. Please contact Dr Melani Schröter if you would like further information. 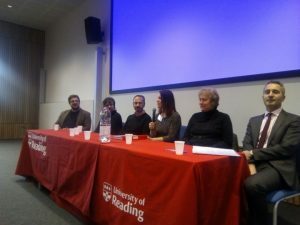 To find out more about German Studies and the other languages we in the Department of Modern Languages and European Studies at the University of Reading – French, Italian, and Spanish – we invite you to to like us on Facebook and subscribe to our Twitter feed. Sara Sullam: uncovering valuable documents in the University’s special collections.